Toy Story trilogy is considered not only as one of the best animated franchised of all time, but also counted among the best movie franchises too! Toy Story 3, the best-reviewed film in the trilogy, ended on a very poignant note that left many in tears. 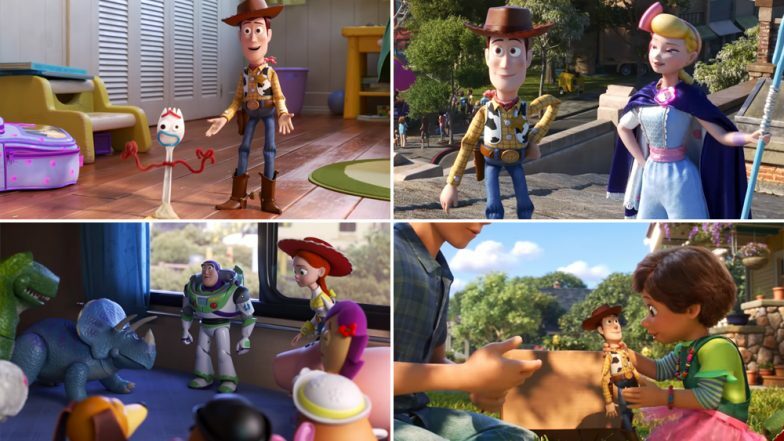 It also rounds up the adventures of Woody, Buzz Lightyear and gang in a very neat manner, as they pass ownership from Andy to Bonnie. Just when we thought there is nothing more to say on their stories, we now have Toy Story 4 that brings back our favourite cowboy and his friends. Toy Story 4 Super Bowl Teaser: Woody And Bo Peep Reunite In A Big Circus While Buzz Lightyear Is Stuck As A Prize In A Game. The first trailer of Toy Story 4 tells us why there is a need to bring us back to their lives. Apparently, Bonnie's new favourite is Forky who she makes out of, yup, a fork. Woody and his friends take upon themselves to protect him to keep their owner happy. However, Forky suffers from an identity crisis and leaves them, which prompts Woody to follow him and both get lost on the way. As they try to make their way back to Bonnie, Woody and Forky meet new, strange characters, while Woody's old flame, Bo Peep also manages to return to his life. But a lot has changed since their separation, as Woody and Bo Peep differ on what they really want as being a toy. Of course, the rest of the toy gang, led by Buzz, is on a rescue mode as always! Toy Story 4 New Teaser: Bo Peep Returns To The Franchise And She Has Had Quite A Transformation! Tom Hanks (Woody) Tim Allen (Buzz), Joan Cusack (Jessie), Blake Clark (Slinky), Wallace Shawn (Rex), Annie Potts (Bo Peep), Estelle Harris (Mrs Potato Head), Michael Keaton (Ken), Jodi Benson (Barbie) return from the previous films. The additions in the voice-cast include Tony Hale, Keegan-Michael Key, Jordan Peele, and interestingly, Keanu Reeves. Toy Story 4, produced by Disney-Pixar and directed by Josh Cooley, is all set to release in June 2019.